While hospitals can learn from other industries, they cannot be improved or run like factories. With work that is more individualized than standardized, and limited control over volume and arrivals, even the leanest-minded hospital must recognize that healthcare systems are more dynamic than nearly any work environment. Written with the creativity needed to navigate the rapidly changing landscape of healthcare, Dynamic Capacity Management for Healthcare: Advanced Methods and Tools for Optimization presents the unique new tools, methodologies, and thinking required of healthcare systems that want to survive and thrive in a reduced reimbursement, higher-cost world. 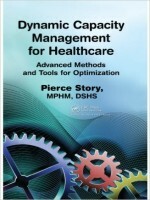 Demonstrating his approaches and recommendations through case studies specific to the complex issues of healthcare delivery, Pierce Story, a long-time and passionate healthcare operations expert, shows how hospitals and health systems can make leaps in performance in an environment in which both financial and human resources are shrinking as expectations for clinical perfection continue to rise. Through its unique approach to the dynamic management of complex care systems, this volume raises the bar for what is possible. This text presents an excellent opportunity for healthcare’s change agents to meet the challenges and responsibilities of our day.